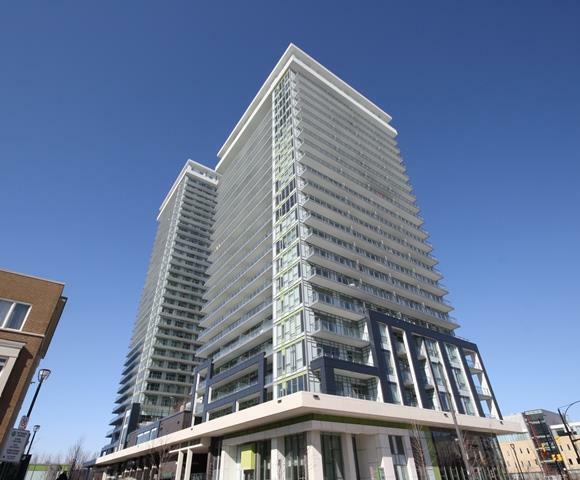 Limelight condominiums are located at 365 Prince of Wales Drive and 375 Prince of Wales Dr in Mississauga. This condominium community was built by The Daniels Corporation in 2012. Limelight is the most environmentally friendly condominium residence within Daniels’ award-winning City Centre Community. An impressive 22-storey glass-clad modern tower featuring a uniquely patterned six-storey podium complete with an illuminating beacon of light at the top. Seamlessly embedded within Daniels’ pedestrianfriendly City Centre Community with easy access to Mississauga’s most anticipated three-acre community park. Situated in the heart of the Mississauga City Centre, steps to Square One Shopping Centre, the Living Arts Centre, City Hall, YMCA, the new Sheridan College Campus, the Central Library,Mississauga and GO Transit as well as highways 403, 401 and 407.Beautifully landscaped entrance courtyard with seating areas and walking paths. Impressive two-storey interactive Lobby designed and furnished by an internationally renowned design team. Tastefully decorated elevators to deliver residents to their destination. Convenient locker and bike storage. A convenient car share program located in the underground parking garage. Executive Concierge welcomes residents and their guests while overseeing the sophisticated building security measures. Resident Services Director provides onsite customer service for residents. Building Automation Systems designed to improve resident comfort and properly manage energy use.Twin garbage chute system for ease of refuse and recycling.Carbon Monoxide monitoring system in parking garage. Club Radiance is a three-floor, 12,000 sq. ft. indoor/outdoor amenity space including: Outdoor Gardening Plots, Work Stations and Potting Lounge located on the 6th floor podium.The Spotlight Gym – a full court gym with the ability to accommodate everything from yoga classes to basketball games and much more.The Fitness Centre that overlooks the Spotlight Gym – offering residents a full range of state-ofthe-art cardio and weight-training equipment. The Starlight Party Room – complete with catering kitchen and bar, this space connects to the Starlight Terrace, including an outdoor billiards table and double-sided fi replace. An expansive Outdoor Terrace – complete with two BBQ areas and an outdoor living room,including an outdoor TV and plenty of seating.The Home Theatre – with comfortable theatre style seating and video game capabilities.The Media Lounge – overlooking the full court gym. Floors 3 to 6 and 22 will have approximately 10 ft. ceiling heights in principal rooms.Floors 7 to 21 will have approximately 9 ft. ceiling heights in principal rooms.Solid core entry door with stained fi nish and brushed chrome lever hardware. Contemporary 3 7/8” baseboards in all areas except bathroom(s) and laundry area which have a tile baseboard. Contemporary 2 1/4” casings throughout. Flat interior doors with brushed chrome lever hardware.Framed mirrored sliding closet doors in foyer and bedroom(s), as per plan.Designer white Decora-style switches and receptacles throughout.White textured ceilings in all areas, except kitchen,bathroom(s) and laundry/storage area which have smooth painted ceilings.Poured concrete fi nish to all balconies; terraces to receive concrete patio pavers, fi nished underside to all balconies.Interior walls primed and painted in latex flat fi nish off-white paint. Kitchen, bathroom(s) and laundry/storage area painted in latex semi-gloss off-white paint. ILLUMINATING FLOORING FEATURES contemporary bamboo flooring in the hallway, living/dining room, den, kitchen,foyer and foyer closet, as per plan.Green Label Plus textured carpet in thebedroom(s).Porcelain floor tile in the bathroom(s). Ceramic floor tile in the laundry/storage area. SPARKLING GOURMET KITCHEN FEATURES choice of flat slab paneled cabinetry from Daniels’select lines.Granite countertop with single bowl stainless steel drop in sink.Single-lever kitchen faucet.Imported porcelain tile backsplash.Custom designed dual use kitchen island with granite countertop, under-counter storage and seating, as per plan.Stainless steel appliances, including 18 c.f. frostfree refrigerator, self-cleaning oven, built-in 24” dishwasher and combination microwave/hood fan located above stove and vented to exterior. GLITTERING BATHROOM FEATURES choice of comfort-height cabinetry from Daniels’select lines.Marble countertop with porcelain sink.Single-lever water effi cient chrome faucet.Luxurious acrylic deep soaker tub with ceramic wall tile surround up to ceiling.Framed, clear tempered glass shower stall in second bathroom, with pre-formed acrylic base and full-height ceramic tile surround, as per plan.Polished edge vanity mirror with wall sconce located above the mirror.Chrome bathroom accessories including towel bar and toilet paper holder. Exhaust fan vented to the exterior.Low consumption toilets. TWINKLING LAUNDRY ROOM FEATURES white full-size, stackable front loading washer/dryer combination vented to exterior. ULTIMATELY CONVENIENT ELECTRICAL FEATURES suite hydro individually metered using ‘Smart Meter’ technology.Individual service panel with circuit breakers.Voice data and coaxial cable wiring throughout.Cable receptacle allowing television connections located in living room, bedroom(s) and den, as per plan.Pre-wired telephone outlets in living room,bedroom(s) and den as per plan.Stylish ceiling light fi xtures provided in foyer, kitchen,bedroom(s) and den, as per plan. Capped ceiling outlet in dining room.Decorative style wall mounted light fi xture in the bathroom(s).All appliances connected and ready to use.Each suite to have an “all off” electrical switch nearthe entry so residents can turn off all overhead lights easily.Energy effi cient lighting in all suites and common areas designed to last longer and use less electricity. PEACE OF MIND SECURITY FEATURES enter-phone and cameras at all visitor entrances allowing for in-suite viewing through cable television connection direct to suite.Resident Key Fob access throughout all common areas and parking garage entry.Convenient underground parking with cameras in the garage at pre-selected locations, along with two-way voice communication to concierge or monitoring station.Rough-in suite entry door contacts provided for intrusion alarm system. Condo fees include: water,gas,central air condition,parking,locker,maintenance of common elements and building insurance.